Tom Anderson, a young father of two, lost his cutting edge IT job at a bank due to a merger. At first he thought he'd be able to find another job quickly, so he didn't tell his wife or his parents. He left home at the same time each day as he had when he'd had a job and returned about the same time. Instead of going to the office, he'd go to the library or a coffee shop where he could use the Wi-Fi to search for a job. His plan was to wait until he had a job before telling anyone. However, the search didn't go as he'd hoped, and before long he'd been living a lie for five months and he was about to lose his home, his cars and his wife. This story could have easily happened in real life. Men seem to have a hard time admitting it when they are fired or their positions are cut. Work defines us more than it should. What I like about this book is that the characters are so real they are recognizable. However, the way the problem is solved in the story is different. I have to admit that I had tears in my eyes for the last third of the book. I recommend this book for anyone going through a loss of trust between husband and wife. It would also be good for anyone with unresolved issues with their parents. Finally, I would recommend it to all men seeking a fulfilling relationship with a woman. 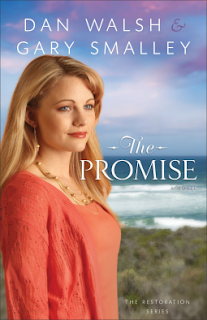 The Promise is the second in a series by these two authors called The Restoration. Watch the video below to hear about the first story in the series called The Dance. COTT: 2014 Olympia, Coming Soon!